Active Directory is a directory service technology used to provide centralized authentication and authorization services for computers and users that are joined to a Domain. 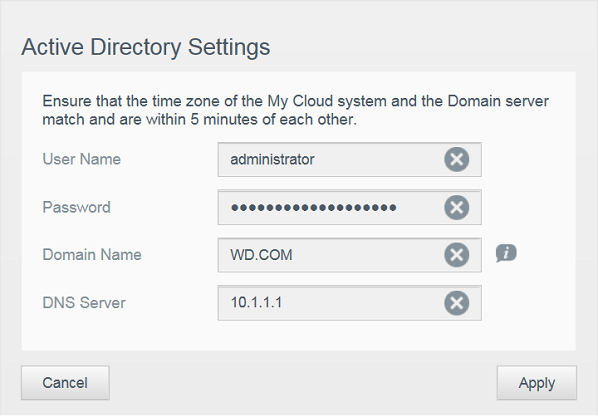 Certain Western Digital My Cloud devices support joining an existing Domain. Click the toggle button next to Active Directory to enable. The Active Directory Settings screen appears. 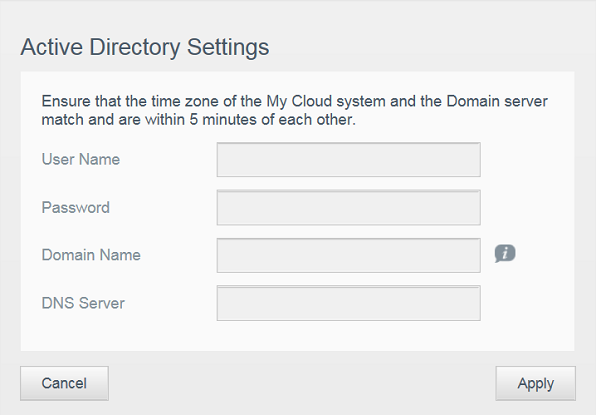 DNS Server — Enter the Domain Name System (DNS) Server IP address. Review the information on the screen, then click Apply. Answer ID 17280: My Cloud Active Directory join fails with "Failed to set servicePrincipalNames"
Answer ID 18008: My Cloud Active Directory join fails with "Failed to Lookup DC info - rpc:Login failure"